c) Bolted-on to a wall or rear of desk or counter without edge. * Sale Price: $139.00! + $28.00 Shipping (Ground contiguous U.S.). - 2 Articulated monitor arms with three adjustable articulations per arm allow the monitors to face virtually anywhere: front, back, up or down. 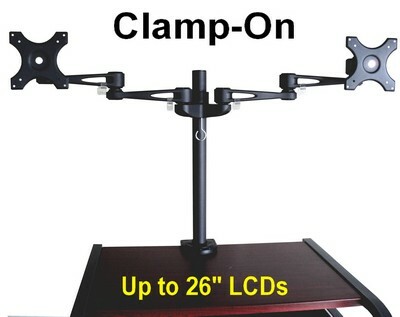 - Flexible installation: clamp-on or screw-on table edge; screw onto a wall. - Easily adjust the height of arm pair all along the 18" high pole. 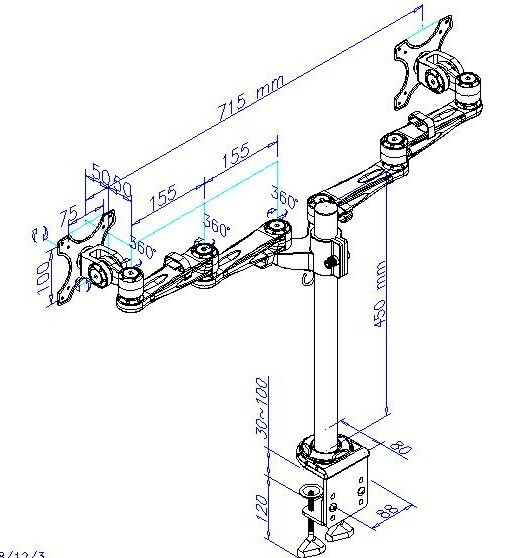 - LCD bracket: VESA 75 & 100 mm (about 3 & 4"). - Torque adjustability: articulations will never go toosoft. Three articulations per arm. 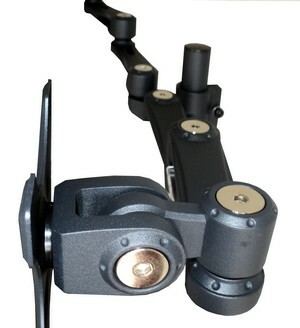 - Each monitor arm holds monitor weights up to 15 lbs. - Cable management clips for each monitor.